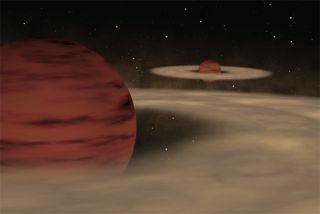 An artists illustration of the newly discovered double planemo system. A newly spotted pair of planet-sized objects floating far away from any starhas astronomers puzzling over how such a bizarre system could have formed. Using theEuropean Southern Observatory's telescopes in Chile, astronomers have spotted a seven-Jupitermass object paired to another 14-Jupiter-mass companion. Instead of orbitingaround a star, however, the two planetary mass objects, or "planemos," are circling each other. Planemosare objects similar to brown dwarfs, failed stars too small to sustain thenuclear reactions required for stellar ignition. But at only a few times moremassive than Jupiter, they resembleplanets more than stars. Thefinding, detailed in the August 4 issue of the journal Science, placesstrong constraints on planemo formation theories andcould shed light on how the strange objects form. About halfof all Sun-like stars have stellar companions. About a sixth of all browndwarfs are also paired. But the new system, called Oph162225-240515, or Oph1622 for short, is the only known planemobinary. "Recentdiscoveries have revealed an amazing diversity of worlds out there. Still, theOph1622 pair stands out as one of the most intriguing, if not peculiar,"said study team member Ray Jayawardhana of theUniversity of Toronto in Canada. The pair isbarely a million years old and located in the Ophiuchusstar-forming region, about 400 light years away. The objects are separated byabout six times the distance between the Sunand Pluto. Infrared observations byNASA's Spitzer Space Telescope suggest that at least one, and possibly both, ofthe planemos are ringed by a disk of gas and dust. Light andcolor analysis of theplanemos strongly suggests they were born at thesame time but scientists aren't sure how they formed. The answer to this latterquestion could determine whether or not the objects are classified as planets. If sizewere the only criteria for being called a planet, then most of the few dozen planemos discovered thus far would certainly qualify.Astronomers sometimes draw the cut off line for whether or not an object is aplanet at 13-Jupiter-masses. Objects more massive than this can burn a form ofhydrogen called deuterium for a short time early in their lives while thosebelow this limit cannot. But somescientists argue that planethood shouldn't bebestowed based solely on mass, and that how an object was created should alsobe considered.Most known planets, including those in our solar system, form out of discs ofgas and dust surroundingstars or brown dwarfs. As far as scientists can tell, the new planemo pair did not form this way. Instead,scientists think the twins formed the same way that many binarystar systems do, when a contracting gas cloud splits in two beforecondensing into a stellar core. "Weare resisting the temptation to call it a 'double planet' because this pairprobably didn't form in the way that planets in our solar system did,"said ESO astronomer and study team member Valentin Ivanov. Accordingto another theory, planemos are embryos ejected fromnascent stellarnurseries. However, the two objects in Oph1622 are so far apart and soweakly bound to each other by gravity that they would not have survived such anejection, the researchers say. Their connection is so tenuous, in fact, that apassing star or brown dwarf could permanently separate the two objects. Theresearchers say the next step is to determine if binary planemosare the rule or whether the new discovery is a rare exception. "Theanswer could shed light on how free-floating planetary mass objects form,"Ivanov said.